If you use two different basses or need an optional sound/boost for your solo bass, this is the pedal. Will make life a lot easier for some players. Lots of tonal flexibility. Price - but for the right players it's worth the money. You often need more than one bass sound on a gig and the Dual Bass Station is purpose-built for the job. This compact preamp lets you select two different preset EQ settings when using one bass, or switch sounds between two instruments. Optimising the sounds between fretted and fretless basses - or the nightmare idiosyncrasies between bass guitar and upright bass - has suddenly become a whole lot easier to change to in a hurry. "Even if you use both active and passive instruments you can get a well-balanced sound between the two"
Even if you use both active and passive instruments you can get a well-balanced sound between the two. It also has a mute button, so when a tuner is plugged into the appropriate jack socket you can still tune in silence. There's plenty of tonal adjustment - each channel is equipped with bass, middle and treble controls with cut and boost available either side of the centre detent. Each channel also has a mid frequency adjuster, so you can really shift those mids for some exceptional sound differences. Although rich in bottom end and solid top frequencies, the pedal avoids booming sub bass or piercing extremities, and since each channel also has its own master volume there's also the general boost factor to consider. This will add new life to your sound and all with noiseless operation. 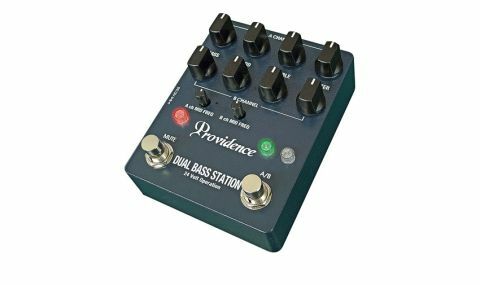 Tone and balanced sounds are the most important factors for any bass player and the Dual Bass Station offers fantastic control with the means to retain two personalised sounds.